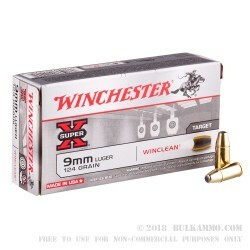 This 9mm Winchester Super-X ammo is premium practice ammunition perfect for the indoor shooting range. Not only are these high-velocity rounds incredibly precise, they contain Winclean primers free of heavy metal particles that can soil the air and make your range time less than enjoyable. 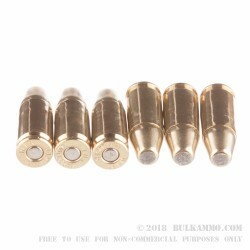 Boxer-primed and non-corrosive, each brass cased cartridge of 9mm ammo in this case of 50 contains a 124 grain brass enclosed base projectile (BEB). Winchester fashions their BEB projectiles like a full metal jacket with an enclosed base. This 9mm Super-X ammo is a great example of how Winchester continues to improve their ammunition even after 150 years in the industry. 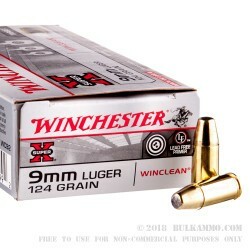 This 9mm Luger ammo is some of the cleanest indoor range ammo they've ever created. 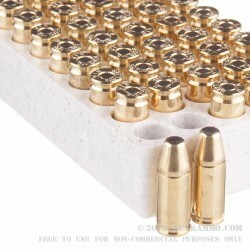 Order a few 50-round boxes of this 9mm ammo and get to the range!